OSITCOM Ltd provides mobile design & development for: Android, iPhone, iPad and windows. You can choose any feature to include in your app or we can provide you with a proposal inspired by your website & business possibilities. 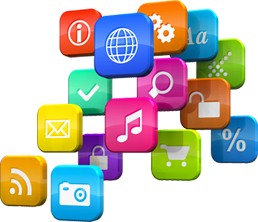 Your mobile application can have all the services you offer on your website and more. Such as: push notifications, GPS, localization maps, tracking records. A mobile software application developed for use on devices powered by Google's Android platform. Apps can run on Android smartphones, tablets, Google TV and other devices. iOS is a mobile operating system developed by Apple. It was originally named the iPhone OS, but was renamed to the iOS in June, 2009. Currently runs on the iPhone, iPod touch, and iPad. Online store for downloading free and paid BlackBerry applications from third-party developers. Downloaded directly to the user's phone, not via the computer. Windows Phone is a mobile operating system for smartphones and mobile devices from Microsoft. Based on the Windows CE kernel. Designed to look and operate similar to desktop versions of Microsoft Windows. If you have a 24/7 streaming online radio station hosted with OSITCOM then we will build a mobile application specifically for your radio station. The app will feature your logo, background image of choice. This way your audience everywhere will be able to listen to your station whether they are on the Android devices (version 2.2 and up is required), Apple devices, Blackberry tablets, Amazon Kindle Fire tablets or Windows Phones. The supported platforms for streaming on mobile devices are Wowza, IIS Smooth Streaming and SHOUTcast live audio streams.